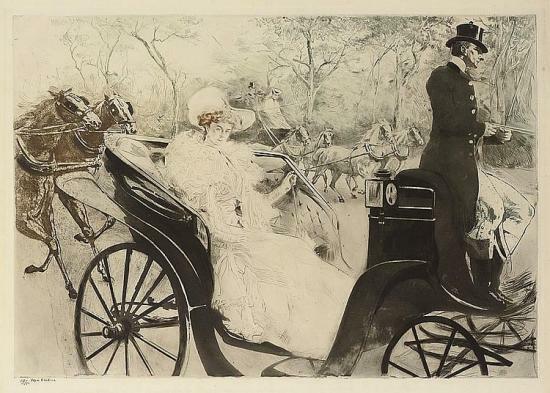 A unique exhibition of etchings will take place at the Centre of Visual Arts and Research, 285 Ermou Street, Nicosia, from 7th November till 17th November 2015 of the famous French/Armenian artist of the Belle Epoque Edgar Chahine (1874-1947). The exhibition will feature about 50 works on paper. In addition it will be supported by collector’s limited edition books by Anatole France, Colette, Joris K. Huysmans, Gustave Flaubert, Maurice Barres, Octave Mirbeau, Paul Verlaine and Charles Baudelaire, all major authors of considerable caliber, illustrated by the artist. Chahine was born in Vienna to Armenian parents. He spent his youth in Constantinople where he received his initial education. He then went on to study in Venice at the Catholic Mekhitarist school of Murat-Rafaelian. After graduating he attended the Accademia di Belle Arti where he studied under Antonio Paoletti and Antonio dal Zotto. In 1895 he moved to Paris where he attended the Academie Julian. Chahines success was astonishingly rapid. He was awarded the gold medal for his work at the 1900 Exposition Universelle de Paris. In 1903 he received another gold medal for graphics at the 5th Esposizione in Venice, which later became knwn as the Venice Biennale. The same year he was also elected an associate of the Royal Society of Painter-Etchers and Engravers in London. In 1904 he was inducted as a member of the Societe Nationale des Beaux-Arts. He was also the youngest member of the group that revived engraving techniques in France, at the end of the 19th and beginning of the 20th century, better known as “The Etching Revival”. These honors occurred when Chahine was still in his twenties, an unusually young age for such memberships. In 1932 the French government honored him with the “Legion d’Honneur”. His works have been exhibited in many famous museums and galleries like The Hermitage in St. Petersburg, Musee Carnavalet and the Bibiotheque Nationale in Paris, The Smithsonian in Washington, The Royal Library in Stockholm to name a few. He continued to produce works until his death in 1947.